Les Miles knows he doesn’t have the best team he’s had in Baton Rouge in 2012, but they’re still good enough to remain undefeated at home over the last 22 games, as LSU made a huge dent in the aspiration of South Carolina to finish higher than ever before this season, beating the Gamecocks 23-21. The Tigers had a real wake up call in their loss against the Florida Gators. The offense was squeaking with Zach Mettenberger beneath center, so Miles simply took it in a different directions. LSU’s success over the years, as with most great SEC teams (except for Auburn in 2010) isn’t about having a dominant quarterback. It’s about having a bigger, more physical, faster group of guys on both the offensive and defensive line, that it pretty much makes up for the lack of talent at quarterback and general skill positions. Against the Gamecocks, how have shows some fantastic defense this season, it was simply about running, running and running. Winning by being physical and pounding the ball. 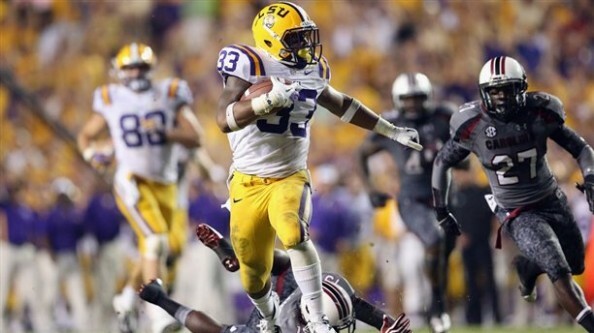 Led by Jeremy Hill (122 yards, 2 touchdowns), the Tigers tore the field with 258 yards on 53 carries. South Carolina just couldn’t get their offense, meaning their running game, going anywhere, held to a total of 34 yards. LSU forced Steve Spurrier to go to Connor Shaw’s arm to try and win the game. Shaw did throw two touchdown passes, but he was also intercepted twice, and couldn’t help Marcus Lattimore (35 yards on 13 carries) in the ground game. Maybe using Dylan Thompson, who’s a better passer than Shaw, would have been a nice change up to things. Carolina were in the game all night long, but just couldn’t get enough from their offense. Mettenberger was still bad, finding it hard against all the SEC defenses he’s faced this season. He completed 12 of 25, throwing for 148 yards, 0 touchdowns and one interception. Les Miles simply turned the game away from him, and won for it. This changes the picture how? LSU are back in the race. They’re going to be highest ranked one-loss team, and this puts everything on their home game against Alabama. The Tide look like another level above everyone else this season, but this rivalry is always something special, and an extraordinary physical effort from his men might get Miles the win to change the entire SEC and national title picture. There are still undefeated teams out-there, but the voters love the SEC and especially LSU and ‘Bama. With one loss and one very big win over a quality team like South Carolina, it looks like the Tigers are back in the race.